Let the Key West Fantasy Fest Begin! It’s almost time for what could be the biggest party across the Florida Keys; Fantasy Fest will be in full swing October 19th-28th. Ten full days of all kinds of fun await the residents and visitors around the Keys. What started out as a small but elaborate costumed parade inspired by Halloween has grown to include over 60 exuberant street fairs, extravagant balls, exciting street marches, and the entertaining, main Fantasy Fest parade. While most of Fantasy Fest is geared towards adults, there’s a family-friendly street fest not to be missed in the Bahama Village of Key West. The Goombay Festival is a cultural celebration as much as it is a party full of continual live music. Set for October 19th-20th, this is the perfect place to bring the kids. A festival needs a Queen and King, and Fantasy Fest is no different. Find out who will be crowned this year’s royal couple on October 19th at the Royal Coronation Stage show. Get into the Halloween spirit with the family-friendly Zombie Bike Ride on Saturday, October 20th. Join thousands of other costumed enthusiasts to make your way to Zombie Fest in downtown Key West. Do you dream of being a superhero or villain for Halloween? 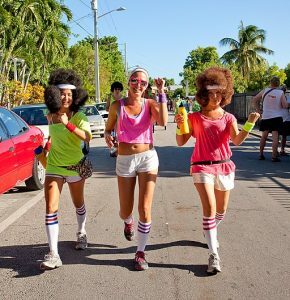 Whatever side you’re on, get into character on Monday, October 22nd with the Heroes and Villains Run/Walk through Old Town Key West. Get your furry friend involved in all the Fantasy Fest fun on Wednesday, October 24th at the Pet Masquerade. 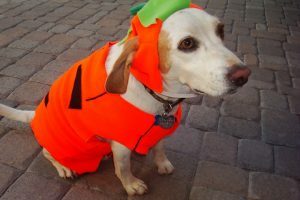 Taking place at the newly opened Truman Waterfront Park, you and your costumed dog are sure to enjoy pet performances, costume contests, and more. Key West has long embraced different lifestyles; come as you are and express yourself here. 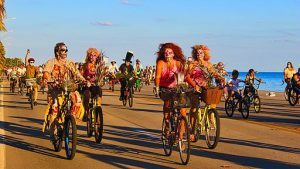 This includes one of the biggest highlights of Fantasy Fest, the LGBT-friendly Annual Headdress Ball, being held at Truman Waterfront Park Amphitheater on Thursday, October 25th. Incredible and creative performances are set to entertain as participants vie for the best headdress grand prize. Whatever you do, don’t miss the Fantasy Fest Street Fair along Duvall Street on Friday, October 26th, or the Masquerade March which will run through Old Town on the same day. The other big event not to be missed is the Fantasy Fest Parade set for Saturday, October 27th; this is the celebration that started it all. There’s also one more chance for family fun on Sunday, October 28th, with Children’s Day at Bayview Park. Arts and crafts, games and rides, and costumed fun will be going on all afternoon. Beyond the big events listed above, there’s a wide range of parties, beer crawls, and artistic performances going on throughout Fantasy Fest. Whatever your idea for a fun Halloween fantasy may be, you’re sure to find here in Key West. Check out the official Fantasy Fest website for the full calendar of events happening this year. If you’re ready to experience year-round Keys living, or it’s time to sell, you can rely on my team and I to put our experience to work for you. Please contact me, Jimmy Lane, for all of your real estate needs. The data relating to real estate for sale on this website comes in part from the Internet Data Exchange program of the Florida Keys MLS, Inc. Real estate listings held by brokerage firms other than Jimmy Lane Real Estate Team | Century 21 Schwartz Realty are marked with the MLS Logo and detailed information about them include the name of the listing broker's office.